Because of its characteristics and way of marketing, one may start using CIFKM for a specific need and afterwards, through trial and error, extend and implement it progressively as new possibilities are discovered. A complete initial specification of all needs and their solution is not required. To estimate the investment return of CIFKM one must think about the time and energy that the persons dedicate each day to locate information of their own company and share it with others, normally by sending emails. This non-productive work will be drastically reduced with CIFKM and that will lead to substantial cost savings. A conservative estimate would be a minimum average savings of 10 minutes daily per person (though probably much more), which represents 2,08% of an 8 hour workday. Obviously more time available does not translate into an immediate reduction in the payroll and personnel costs, but it means that with the same people and resources one can do more productive work, ie increase productivity. 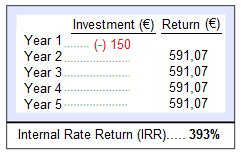 Considering only the cash flow from the savings due to using CIFKM in the first 5 years (1 investment 4 returns) and with the cost of an internal user license (single payment) being 150€, the INTERNAL RATE OF RETURN (IRR) is 393% that is spectacular. We are not used to such IRRs, which means that each year one obtains much more than was originally invested. The conclusion is that the use of CIFKM is a “singularity” in the companies, and the increaase in productivity is not a progression but a jump. Its graphic representation is a discontinuous curve.